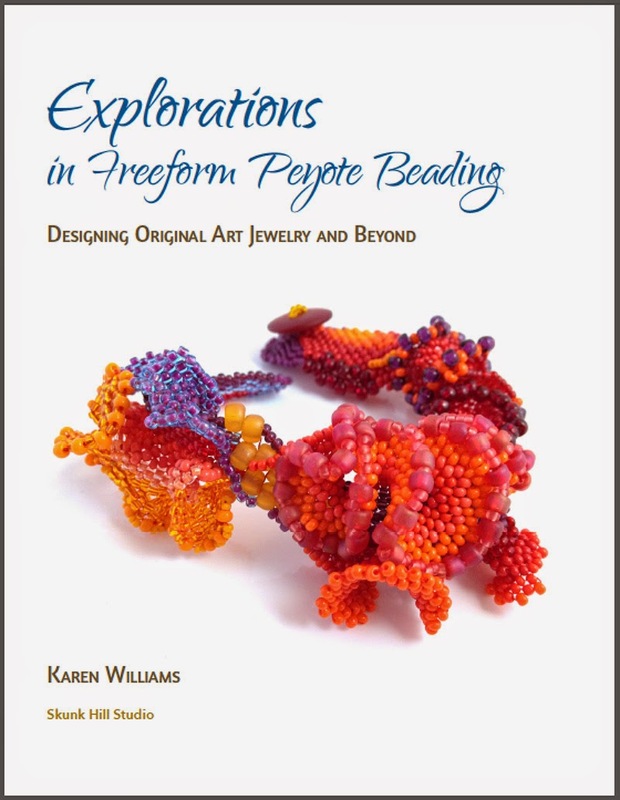 Welcome to day one of the Book Blog Tour for Explorations in Freeform Peyote Beading! This week five of the contributing artists and I are celebrating the book's publication with a virtual tour. There will be new posts each day and a chance to win door prizes! Leave a comment at each blog for up to a total of eight chances to win. Prizes listed below. Behind the Scenes - like the special features section on the DVD, here's a peak into a few random facts about the creative process behind Explorations. Inception Date: One year ago today I launched the Kickstarter to support the book's production. After several months of debate and planning, I fully committed to the project on January 15, 2014. The Kickstarter was my way of introducing the idea to the world and saying 'Hey, what do you think?' After that, there was no easy way to back out - it was full steam ahead until the project's completion. That was one of the scariest days of my life. Looking back at my Kickstarter proposal in preparation for writing this post, I was pleasantly surprised to note the finished book is remarkably close to my original vision. Surprising because it seemed like the book and I wrestled constantly over the direction it would take. Watching my little video, I realized I very nearly have a book trailer! It would need a better audio track though; I sound like I'm in a wind tunnel. Maybe once I finish the Kindle and ePub versions. By the numbers: All told, Exploration's 174 pages includes images of ninety three pieces by twenty two artists (including myself) from three continents and four countries. Detailed photo essays give a closer look at the construction and/or design process for twenty nine of the pieces, ranging from earrings and brooches to bracelets, necklaces, beaded bottles and even three-dimensional beaded fish. Contributing artists: The sheer talent of the contributing artists is inspiring. Some I knew beforehand, many were new to me. 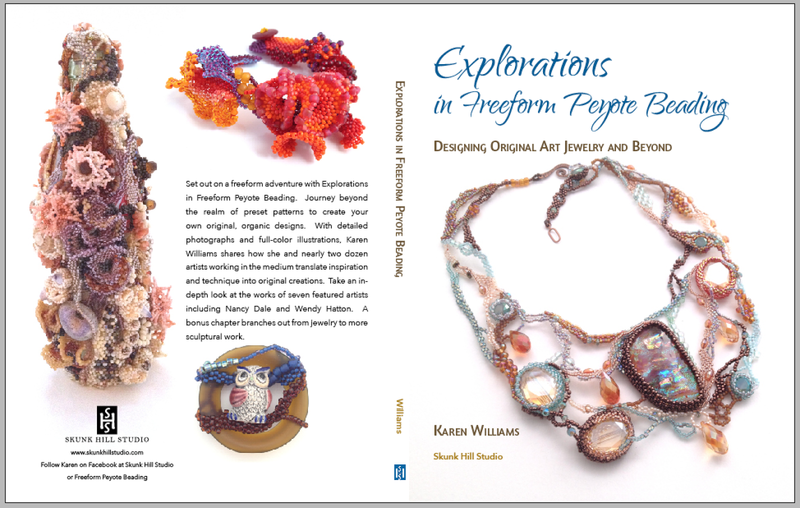 I didn't know it at the time, but I fear I may have bullied Cynthia Machata into creating her first freeform peyote necklace for the book. I can't feel too badly about it because her Surf necklace is truly stunning. Mary Foyes and I went through several rounds of photographs of her First Holy Communion Veil before arriving at the final photos, taken by Shauna Ploeger. They are some of the finest in the book, and include the only photo in the entire book with a live model. I felt a bit like a stalker, contacting Ibolya Barkóczi to ask if I could use one of her bracelets to illustrate working along the width. Luckily she said yes and graciously sent several photos from which to choose! Beta Testers: Borrowing from the software industry, I released six Beta versions to a subset of my Kickstarter community, sent once a month from June through November. The first Beta was embarrassingly low on content. Only 25 of the original 150 pages had anything on them besides the page headers. Of the twenty five pages with content, many boasted a single image as a promise of what was to come. I credit those Beta releases with keeping me honest and keeping me on track. Knowing that forty-two people were waiting to see what I'd accomplished each month was a great motivator to stay on schedule. Especially after my initial embarrassment. Cover Image: At right is my earliest version for the book's cover. The only image carried over to the final cover is my Coral Dancer bracelet. In the proofing process, I ended up having the printers run two separate physical proofs. This is the cover for the first proof. The final cover was one of three I designed and was the overwhelming winner of a cover contest I ran with my Kickstarter community. The final cover back includes the works of my seven featured artists, which pleases me. But I still really like this cover, too. No party is complete without Door Prizes! I am super excited about this Blog Tour and put together prizes with lots of freeform beady goodness to celebrate. updated 1/25/2015 - the prizes have grown since my original announcement, largely thanks to JJ Jacobs of Creative Soul Revival. Second Prize (2): a Freeform Bracelet kit (beads only) to make your own version of my Nautilus Flower Cuff OR Demeter’s Harvest Bracelet. I will draw one winner for each bead set. 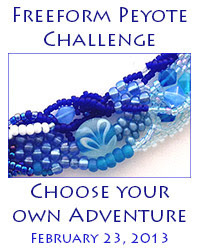 Each set will include all of the beads, including the closure, to make a bracelet similar to mine. Third Prize (2): Small bead soup mix and postcard set. This set will include enough beads to make a smaller project like a Personal planets beaded bead, pendant or several rings. These prizes have grown, again thanks to JJ Jacobs! 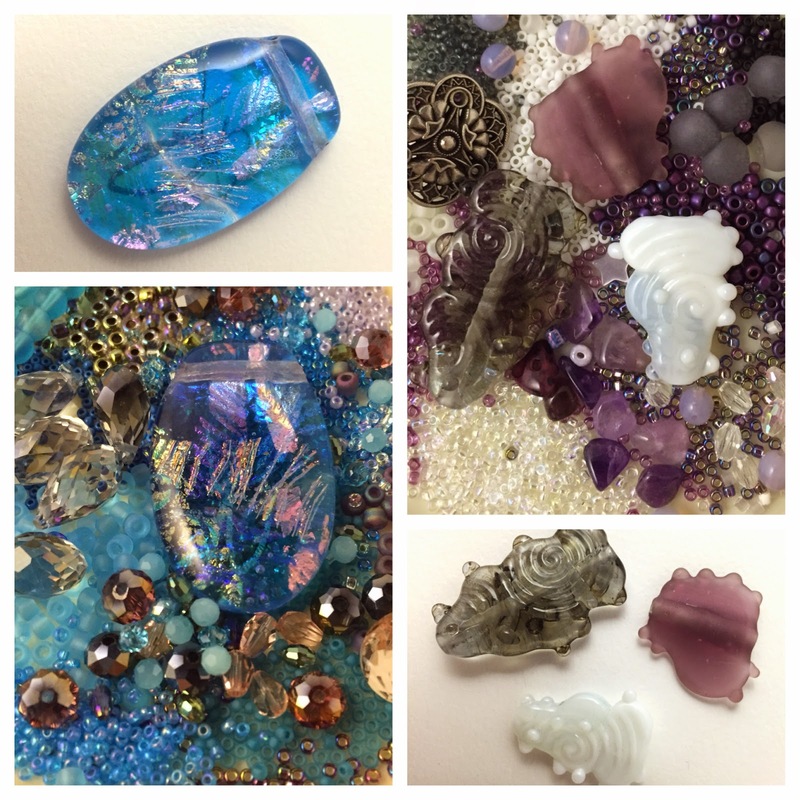 They now include bead soup mixes with three of JJ Jacob's Waterdrop 'sea glass' beads. You can see more of her beads here! 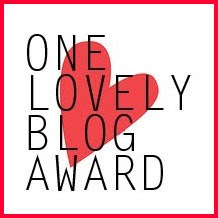 Entries: One comment per person per blog post for a maximum of eight chances to win if you visit and comment on all eight blogs. Please help spread the word on Facebook, Twitter and other social media! No extra entries for this, but lots of good karma for helping support and promote independent artists. Make sure that there is an email associated with your comment! I will contact the winners by email by Thursday, January 22nd. If I cannot reach you by email, I reserve the right to choose another winner. I'll post the winners on my blog on Saturday, January 24th. International visitors are welcome to enter. I'm willing to pay up to $10 worth of shipping for each prize - if shipping costs more than this, you would be responsible for the extra shipping. Once I have your postal address, I can give you specific shipping costs. As an alternate, you may choose to receive a digital copy of the book instead of your regular prize. 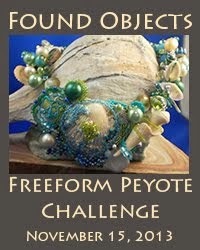 Thanks for checking out Explorations in Freeform Peyote Beading! Have fun hopping this week, and be sure to check in next Saturday to see who won the random drawing! Gentle nudge sounds so much better! :) Thanks for helping to make Explorations more interesting. I am looking forward to this event ~ YaY! A perfect way to showcase your hard work, that of the contributors, and to shoo away the winter blahs for a bit. I'm looking forward to seeing the other blog posts too! I have learned so much from all of my contributing artists. Your book is on my wishlist for my birthday in feb. I have never do freeform peyote. I love to try it. Hi Karen, can't wait to receive my e-copy of the book!! Been waiting a long time (hint-hint) lol Judy P.
A great accomplishment this book. I hope to win one!! I wish I had stopped in to comment yesterday, sorry! I was out of commission for the second half of the day! I am so honored to be part of this massively awesome project! Thank you from the bottom of my heart, Karen! I'm off to share!! Although not a seed bead person myself, I'm always in awe of what you all do w/those tiny beads and the free form photos from your book are by far some of the most jaw-dropping pieces I've ever seen. Congrats and best wishes on a successful book blog hop tour! Shel - as fellow artists, I think it's easier for us to admire works in other mediums besides our own. I know I am always in awe of people who do lampworking and some of that gorgeous wire work. 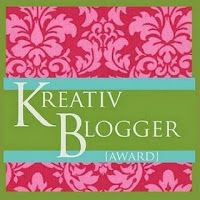 Amy - this is a progressive blog hop, which means new posts will appear each day through Tuesday. 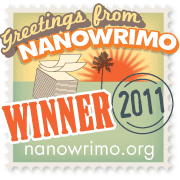 Today there's a new post from Nancy Dale. You can visit/comment on any of the posts that are up currently. Your book is absolutely the best freeform book available and I finally got it!!! Congratulations on the book Karen! 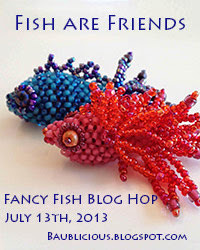 It's awesome and I'm honored you included my In The Pink necklace among such beading greats! The book looks amazing. I hope it inspires a whole new generation of free-formers!!! How the heck did I almost miss this??! Thanks to Nancy for her post on FB, which I did see. I of course have the digital version of this wonderful book, but would LOVE to have a signed copy as well, as I know someday you'll be famous Karen, and it'll be may support me in my retirement. :-) Any of the bead soups would be awesome as well! I LOVE bead soup! I've done some pinning on Pinterest from Nancy's blog as well. I've said it before and I'll say it again -- I am beyond thrilled to be included among the fabulous artists in this gorgeous book! I'm so proud of being part of it that I truly considered carrying the book on the train with me and accosting strangers with a "Hey, look, I made something in here!!!!" Thank you for being a good friend, a great inspiration, and an immeasurable boost to my self-confidence as a beader. I am following your book tour. .am I mistaking or did it stopped by the last two blogs? Congratulations on your new book. I admire those that do beadweaving. Would love to win a kit to make one of your pieces. Oooh! How fun! I already have your book, but haven't had a chance to play with it yet! Now onto the rest of the stops on the tour. Oh this book is definitely on my wish list. Where have I been, have got to thin out my life, missing really good stuff. This book sounds awesome, I would love to win a copy. This is a subject that has been needing a book really bad. Best of luck with all related to it, hope its a best seller in the beading world. I would love to win a signed copy. Love the digital version of the book. Thank you all who have helped make my first ever Book Blog Tour a success! I am compiling names and entries now for the drawing. I am finally at a PC where I can comment about your blog tour and book. I learned so much and was so proud to be a part of Explorations. I'm sure there is a part of the book that everyone can learn something from even if you're a pro at freeform. I wish you continued success with Explorations and your business. Thank you Mary! I was so pleased to be able to include others' work this time around, and truly enjoyed the sense of community that and my Kickstarter created. It made such a difference in the process, knowing I had people who were looking forward to the finished book. I love what I have seen so far of your book. Even if I don't win, I can't wait to order it. I do hope sales go well and here's to your next book!